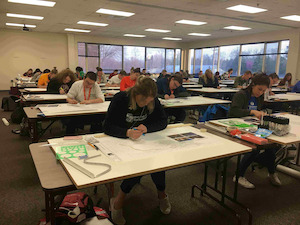 As spring break drew to a close, most college students were having one last hurrah before classes started back, but the students from 61 schools at the National Collegiate Landscape Competition (NCLC) were giving it their all in various green industry tests on Friday, March 16. This year’s 42nd NCLC was held at Alamance Community College in Graham, North Carolina. In one of the classrooms, tables with blank design boards stood at the ready for students as they quietly trickled in for the exterior landscape design event. Some looked nervous, but they all came prepared, setting out the tools of their trade. Students work from a base plan during the exterior landscape design event. For this event, students had an hour and 50 minutes to follow the program requirements and include all the design elements listed. The designs were judged based off of meeting the program requirements, creativity, usage of space and other categories. Time served as a tie breaker for this event. Adam Hallauer, design manager for Designs by Sundown, who was one of the industry members helping run this event, said it challenges students to work under pressure while still creating a good design. In other buildings on Alamance’s campus, students participated in various plant ID tests. At the plant problem diagnosis test, students bent their heads over 28 stations, looking over the various plant samples and pictures having to answer four questions per station. Some of the questions required students to know the life cycle and management of the sample, its common or scientific name and other details. 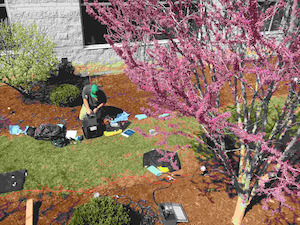 “When you’re dealing with plants, you have to be able to correctly diagnosis it,” said Meg McConnell, a diagnostic service manager with Bartlett Tree Experts. McConnell would occasionally call out time for students to switch and move on to the next ailing plant. Throughout the buildings, students were tucked away in corners or hallways studying or chatting about the industry. Studying was particularly crucial for events like annual and perennial ID, as participants had to know the proper spelling of the scientific and common names of 50 plants out of the 200 possible species listed online. Meanwhile, outside the day was slowly warming up as the sun climbed in the sky and school teams worked on installing irrigation and operating various compact equipment. Students tried out the new mini track loader operation event at the 42nd NCLC. At the skid steer operation, event sponsor Caterpillar changed the course up slightly from past years, no longer using a bucket filled with water to gauge students’ operation skills. The skid steer operation is a timed event and safety plays a large portion of the score. Aside from driving home the importance of the various safety tasks one should do every time when operating, Couch says NCLC is an ideal time to expose students to the different brands and equipment available. First time NCLC attendee Tim Follin, a junior horticulture major from the College of DuPage, said the event was a great learning experience and opportunity to meet people from across the country you wouldn’t normally meet. A new event to NCLC this year was the introduction of the mini track loader operation. 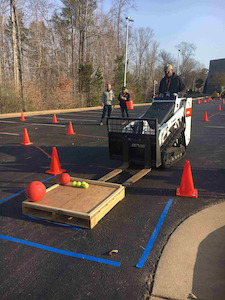 For this event, students performed a general knowledge test and then used the mini track loader to move pallets with various sized balls worth varying amounts of points to different locations across the course. Finalists worked to repair their Stihl engines. 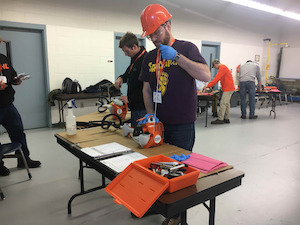 Secluded in a quiet shop room, the 10 finalists for small engine repair were briefed on the event before they went to their stations to start working on a Stihl KombiSystem power head. The finalists were required to conduct a full Stihl engine check safely, look up the parts needed to repair the engine and fix the unit so it would run properly. The engines students work on is changed every year to prevent certain competitors from having an advantage. David Sease, a technical training coordinator with Stihl, said students can learn a lot from this event due to power equipment being such a large part of the industry. As the day progressed, university teams gathered around the perimeter of the hardscape installation event, a crowd favorite, cheering on their teammates. Hammers and tampers pounded and saws ground as the teams rushed to install their roughly 8 by 8 patios and fire pits. “Hardscaping is actually a growing segment of the green industry and so it’s really fun to be able to showcase hardscaping itself as a segment of the industry that works out really well for promoting the overall outdoor living concept,” said Tim Huinker, a construction specialist with Anchor Wall Systems, who competed in the hardscaping event himself 30 years ago. The event was overseen by 10 judges watching crews work, monitoring their safety. While each team had the same set of plans, each group went about installing their hardscapes with different processes with varying paces. Many crews followed the slow and steady route, but some were unable to finish their projects after spending too much time creating the base. After time was called, the judges assessed various criteria, including structural soundness and attention to detail. Landscape lighting was one of the many events students were able to compete in. Other events focused more on the lawn care side of the business, including truck and trailer operation and landscape maintenance operation. Both of these tasks required students to navigate obstacle courses and display their ability to complete them safely. In a parking lot over from the truck and trailer event, chainsaws and drills were powering away under the large tent hosting wood construction as teams worked on building a bench similar to the one made in 2016. Up in the trees, students were demonstrating their knowledge of the proper arboriculture techniques with one tree for ascending and another for testing throwline skills. Michael Dye, the district manager of the Davey Tree’s Minneapolis operation, says these events teach students patience and teamwork, as they have to count on their teammate just as they would with their co-workers in the real world. 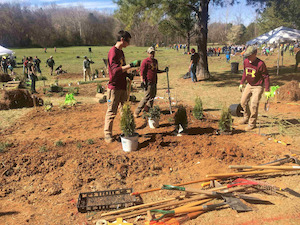 As the day drew to a conclusion, school contingents began to trek toward the final and fan-favorite event, landscape plant installation. Diana Vasquez with Kansas State competed in her first event this year at NCLC. 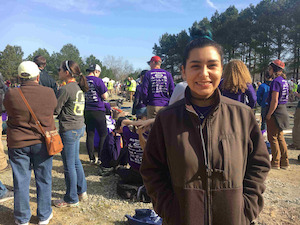 Returning to NCLC for a second time, Diana Vasquez, a junior horticulture major from Kansas State University, was one of the many students competing in the landscape plant installation event. Despite the sun still shining, the majority of the students had to deal with extremely muddy plots for the installation. Crews raked and shoveled clods of dirt, while others started measuring and spraying the outlines of the design on their plots. Coming back with a game plan after trying their hand at the event last year was the three-student team from the County College of Morris from New Jersey. The group acknowledged they didn’t prepare well enough last year and they say they have gone over the plan more than once this year. The County College of Morris team decided to divide and conquer the landscape plant installation. Teammate and fellow junior Marcelo Simone said they would make a point to not throw tools and divide and conquer this year. The team also tried its hand at the hardscaping installation for the first time this year and they are already planning how to improve from the experience.